Cadbury chocolate in augmented reality, Philly cheese inspiration on mobile and geotargeted offers for BelVita Breakfast Biscuits are just some of the projects to come out of Mondelez International’s Mobile Futures program. 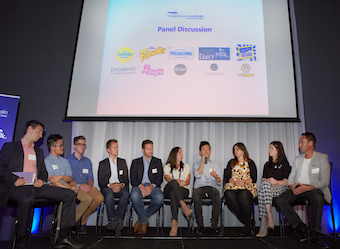 Mondelez International has announced the results of the three-month program, in which iconic Australian brands including Cadbury Dairy Milk, Favourites, BelVita, Marvellous Creations and Philadelphia Cream Cheese partnered with some of the country’s most progressive tech startups to drive innovation. Following a competitive pitch process, the brands chose five local startups, Proximiti, Snaploader, SkyFii and MyShout to launch projects in 90 days addressing their business challenges using mobile concepts. After the three-month program, the teams can reveal their pilot results. Snaploader, an image recognition and augmented reality app, brought Cadbury Dairy Milk’s flavour personalities to life with an augmented reality feature and a variety of recipes. In early November, the pilot launched with a competition to ‘win your height in chocolate’, through a Facebook campaign and in-store activations in 20 Victorian Woolworths stores. Consumers entered the competition by downloading the Snaploader app and ‘snapping’ an image of a Cadbury Dairy Milk pack. The pilot started off successfully – in the first week of launch, more than 1100 people downloaded the app. SkyFii’s Wi-Fi technology is helping Cadbury Favourites to better understand customer shopping behaviour, focusing on the understanding that consumers tend to purchase this product at the last minute. The November pilot focused on promotional large Christmas packs of Favourites, measuring shopping patterns to identify the right time to connect with customers, drive them in store and measure conversion rates. SkyFii and Cadbury are planning to expand the scale of the tracking to provide even deeper insights, potentially expanding into South East Asia. Philadelphia Cream Cheese worked with Issue app to create mini-magazines for mobile and tablet featuring food inspiration and engaging stories. Launching in September, just 23 days after partnering, the team along with Smudge Publishing created a branded publication that reached 75,000 consumers in three weeks. The next phase of this project may involve bringing the mobile magazine experience in-store to engage consumers at point of purchase. Location-based services platform, Proximiti, used personalised content and geo-analytics to learn more about BelVita consumers. The startup’s technology helped amplify the brand’s ‘morning wins’ campaign by sending geo-targeted offers to direct the path to purchase. The first phase of the pilot on 14 October at Flinders St train station in Melbourne offered nearby commuters a free coffee and a BelVita sample, and recorded 43% redemption rates. MyShout, an app that allows consumers to ‘shout’ vouchers to friends via mobile, explored a new and potentially more cost efficient sampling method for Marvellous Creations. A small scale pilot trial of mobile coupons in Sydney CBD achieved an above-target click-through and a 11.7% claim rate. Marvellous Creations is now investigating options for transitioning the behaviour of buying drinks/meals for friends into the chocolate category.